The FRQNT’s mid-term evaluation process of ReSMiQ ended with a meeting between the center’s management and the evaluation committee at the FRQNT offices in Montreal. We are awaiting the verdict of this committee, but we are confident that the result would be positive. After an evaluation of all our scholarship and financial aid programs, it was decided to improve them in order to better serve the research members and to increase support for students in their studies and research. We invite you all to consult the web portal to know the new rules of our various programs. As for the technical activities of our members, we have completed the 7th edition of the ReSMiQ Innovation Day (JIR) which was enriched by numerous technical demonstrations. in addition to lectures given by two ReSMiQ members (Paul-Vahé Cicek from UQAM and Wei-Ping Zhu from Concordia University) and Jeyanandh Paramesh from Carnegie Mellon University in the United States (DL IEEE SSCS). Many thanks and congratulations to all the students who submitted their project and congratulations to the winners of the contest. Furthermore, after an undeniable success in Montreal last June, the 17th NEWCAS conference will be held in Munich between June 23 and 26, 2019. We congratulate the team that completed NEWCAS’18 with great success. It is for this purpose that we strongly encourage ReSMiQ members to submit their publications in large numbers and thus continue the tradition of quality of this conference initiated in 2003. ReSMiQ’s management team wishes you a happy holiday season and a Happy New Year 2019. – Dr. Gosselin from Université Laval receive jointly with his colleagues the prestigious NSERC Brockhouse Canada 2018 award for their research work on designing tools to improve knowledge of the brain. 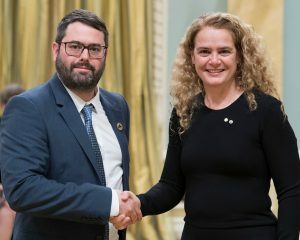 Benoit Gosselin, U. Laval; Julie Payette, Governor General of Canada. – Dr. Gosselin and his colleagues from Université Laval received a Research Tools and Instruments Grants from NSERC to develop innovative tools to support brain research. – Dr. Langlois and Dr. David from Polytechnique Montréal are supervising Ahmed Abdelsalam at the Ph.D. whose recent article entitled “POLYBiNN: A Scalable and Efficient Combinatorial Inference Engine for Neural Networks on FPGA” received the Best paper Award at the Conference on Design and Architectures for Signal and Image Processing (DASIP 2018), held in Porto, Portugal, from October 10th to 12th. – Dr. Beltrame from Polytechnique Montréal is the recipient of the Nanjing City Prize for Innovation in Science and Engineering at the IEEE RO-MAN conference held in Nanjing, China. 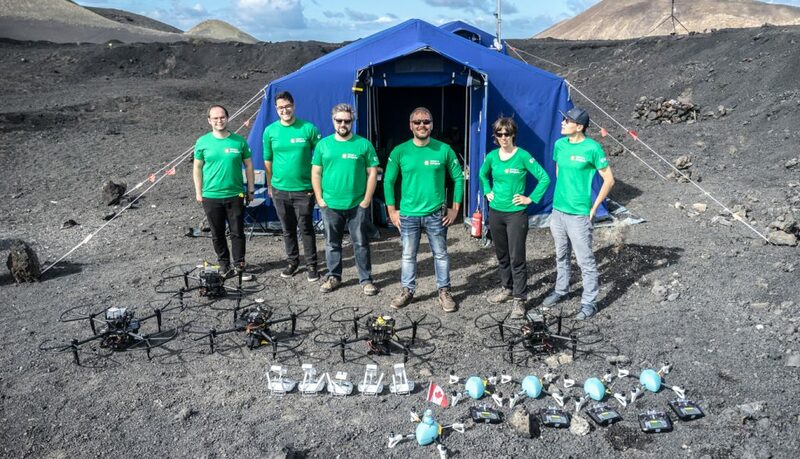 – Dr. Beltrame from Polytechnique Montréal organized PANGÆA-X 2018, a field experiment in Lanzarote in the Canary Islands jointly with the European Space Agency (ESA). Astronaut Matthias Maurer used robotic control systems and the team tested multi-robot planetary exploration with 6 drones. – ReSMiQ scholarship for M.Sc. and Ph.D.
H. Fu, S. Roy, and J. Cheng, "Applying Hankel's Expansion for Performance Analysis in Double-Nakagami (Generalized-K) Fading Channels," IEEE Transactions on Communications, (Online early access) May 15th, 2018. F. Fang, H. Zhang, J. Cheng, S. Roy, and V. C. M. Leung, "Joint User Scheduling and Power Allocation Optimization for Energy-Efficient NOMA Systems With Imperfect CSI," IEEE Journal on Selected Areas in Communications, vol. 35, pp. 2874-2885, Nov. 2017. V. Vakilian, J.-F. Frigon, and S. Roy, “On increasing the slow fading channel diversity using block coded MIMO-OFDM with reconfigurable antennas,” IEEE Trans. Vehicular Technology, vol. 65, no. 9, pp. 7207–7218, Sept. 2016. T. Duc-Tan, T. H. Huynh, S. Roy et D. V. Dao, “Constrained optimum design of 3-DOF micro accelerometers,” IETE Journal of Research, 2 Oct. 2014. V. Vakilian, J.-F. Frigon, S. Roy, “On the Covariance Matrix and Capacity Evaluation of Reconfigurable Antenna Array Systems,” IEEE Trans. Wireless Communications, vol.13, no.6, pp.3452–63, June 2014. P. Leroux and S. Roy, “Designing and optimizing swarming in a distributed base station network : application to power control,” ACM Trans. Autonomous Adaptive Syst., vol. 7, no. 4, pp. 24 :1–24 :19, July 2012. J. C. G. Pimentel, E. Gad, and S. Roy, “High-order A-Stable and L-Stable State-Space Discrete Modelling of Continuous Systems,” IEEE Trans. Circuits and Systems I, vol. 59, no. 2, pp. 346-359, Feb. 2012. In this paper, we propose a new block coding scheme to increase the diversity gain of multiple-input-multiple-output (MIMO) orthogonal frequency-division multiplexing (OFDM) systems over slow-fading wireless channels. We assume that the antenna elements at the transmitter are reconfigurable and capable of independently changing the physical characteristics of their radiation patterns. The composite right-left handed leaky-wave antenna is an example of reconfigurable antennas with such characteristics. We use this feature of the antennas and develop a block coding scheme that exploits, in addition to the spatial and frequency diversity, a new additional degree of diversity, which is called state diversity. We determine the maximum achievable diversity order of the proposed coding scheme in spatially correlated frequency-selective channels. To demonstrate the performance of the proposed block coding technique, we provide numerical results and compare them with those of the previously developed coding schemes for MIMO-OFDM systems. The results indicate that the proposed code achieves significantly higher diversity and coding gain, even in spatially correlated channels, compared with the existing counterparts. Fig. 1. Block diagram of a reconfigurable MIMO-OFDM system employing reconfigurable antennas at the transmitter. Fig. 2. The bit error rate (BER) versus SNR for a reconfigurable multiantenna system with Mt=2, P=2, Mr=1 in a two-ray channel with a delay spread of 20 μs. Our proposed coding scheme outperforms the codes presented before by about 6 and 4 dB, respectively. This performance improvement demonstrates the superiority of the proposed QOSF scheme, which can exploit the extra radiation pattern diversity gain offered by the use of reconfigurable antenna elements.